A good pair of on-ear Bluetooth headphones is surprisingly more expensive than you want it to be. Tack $100-$150 onto the price you'd ordinarily pay for a certain level of quality, and that's the price you're going to pay for Bluetooth. And yet Sol Republic's excellent, budget-friendly Tracks headphones, liberated from their wires, come at a price that seems downright reasonable. On the surface, the Tracks Air design is similar to its wired predecessors: Two circular plastic earcups that slide onto an interchangeable plastic headband. Initially, you might notice that one of the cups is now equipped with a couple of buttons to control playback and pairing, as well as a USB charging port so you can juice up the electronics inside. The design of the headphones was tricky because—as with most Bluetooth cans—these only have a radio and active electronics on one of the earcups. 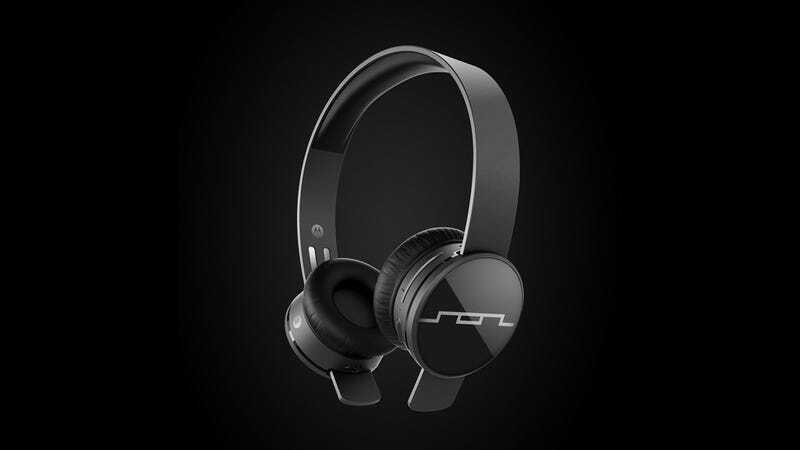 In order to retain the swappable band while at the same time ditching the wires, Sol Republic had to add a pair of conductive contacts that run from one end of the band to the other. So the music goes from your Bluetooth device through the air to the right earcup, then passes through this conductive track to the other earcup. Clever. Yes, the headphones also come with wires so you can use them on a plane. There are microphones built into the earcups so you can make phone calls. And advertised battery life is 12 hours.